A prolific Human Process Facilitator & Trainer and Guest Speaker with prestigious Bschool carries 16 + years of rich experience where she was heading Learning & Quality verticals. Her areas of expertise include Organization Development, Team building and Change Management & leadership, Instructional Design and Six Sigma, 5S & TQM. She stands tall with her rich education background and presently pursuing PhD (First lady in India doing research on Followership). 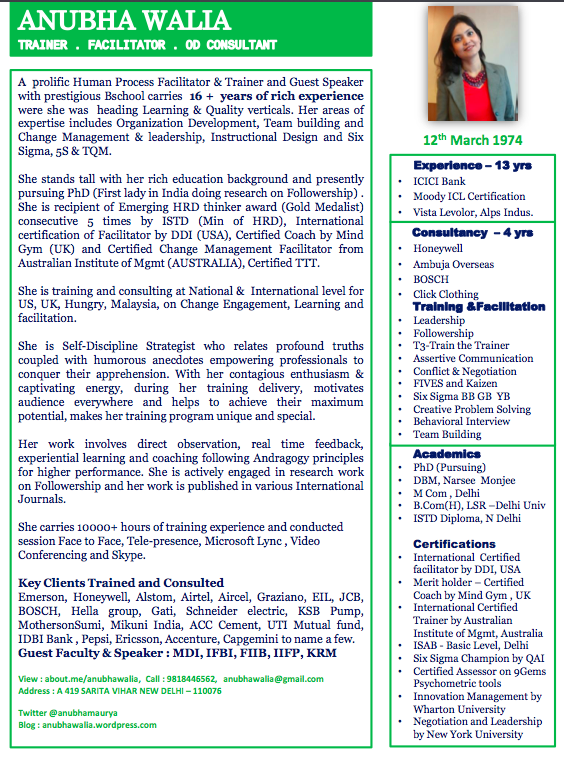 She is the recipient of Emerging HRD thinker award (Gold Medalist) consecutive 5 times by ISTD (Min of HRD), International certification of Facilitator by DDI (USA), Certified Coach by Mind Gym (UK) and Certified Change Management Facilitator from Australian Institute of Mgmt (AUSTRALIA), Certified TTT. She is training and consulting at National & International level for US, UK, Hungry, Malaysia, on Change Engagement, Learning and facilitation. She is Self-Discipline Strategist who relates profound truths coupled with humorous anecdotes empowering professionals to conquer their apprehension. With her contagious enthusiasm & captivating energy, during her training delivery, motivates audience everywhere and helps to achieve their maximum potential, makes her training program unique and special. Her work involves direct observation, real-time feedback, experiential learning and coaching following Andragogy principles for higher performance. She is actively engaged in research work on Followership and her work is published in various International Journals. She carries 10000+ hours of training experience and conducted session Face to Face, Tele-presence, Microsoft Lync, Video Conferencing and Skype.